These can be single celled organisms such as yeast. Yeast reproduces asexually through budding, and it is used in making bread, beer and wine. Most fungi are multi cellular e.g. mushrooms and mucor. 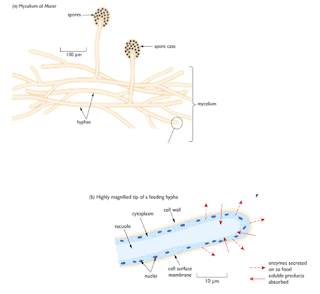 They are composed of thread like structures called hyphae which together form a network called mycelium. 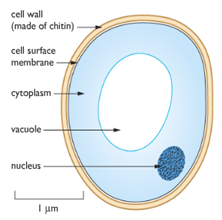 Have cell walls made from chitin. Do not photosynthesise as they do not have chloroplasts. Reproduce sexually through structures called sporangium e.g. mushrooms that release spores. 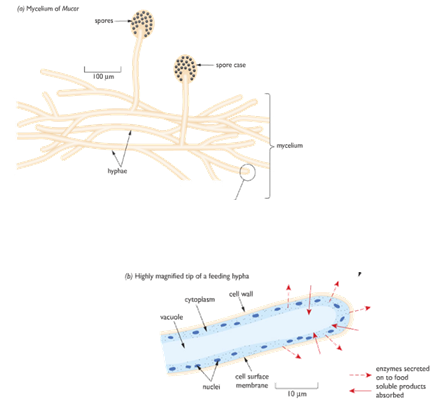 When the spores land, new hyphae grow branching to form a new mycelium. Some fungi are pathogens (causes disease) e.g. fungus causing ringworm. They do this by extracellularly secreting digestive enzymes onto their food to break it down into small soluble molecules which can then diffuse from a region of higher concentration to lower concentration.